Ph.D., Electrical Engineering, University of Saskatchewan, Canada. MS, Electrical Engineering, University of Saskatchewan, Canada. B.S. (Honors), Electrical Engineering, Punjab Engineering College, Chandigarh, India. Vice President, Associated Power Analysts, Inc., 1980-Present. See the corporations consulted for under consultant. 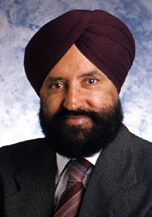 Professor & Director, Electric Power Institute, 1992-1997. Professor & Associate Head, Electrical Engineering, Texas A& M University, College Station, Texas, 1986-1992. Director, Power Systems Program at the National Science Foundation, 1995-1996. PMAPS Merit Award 2008 – Life long achievement award by the Probabilistic Methods Applied to Power Systems International Society (PMAPS), “for developing probabilistic methods for power systems”. IEEE Power Engineering Society, “Electric Delivery System Reliability Tutorial Award”, 2007. IEEE Power Engineering Society, “Outstanding Power Engineering Educator Award”, 1998 for “Innovative Leadership in Power Engineering Education”. Ross Medal of the Engineering Institute of Canada for the best Electrical Engineering paper for 1972, “The Frequency and Duration Method of Generating Capacity Reliability Evaluation”, Transactions of EIC, Vol. 15, No. C-1, March 1972. Distinguished Electrical Engineering Professor, Institute of Electrical and Electronics Engineers (IEEE) Student Chapter, 2004. This was a special award by the student chapter given for the first time. Named Texas A&M System Regents Professor, Texas A&M System, December 2001. Awarded the Texas A&M Former Student’s Association, University Level Distinguished Award in Research (Highest university award in research), TAMU, 1997. Dresser Professorship, for excellence in research and education 1992-1993. Halliburton Professorship for excellence in research and education, 1986–1987. Senior TEES Fellow, for excellence in research 1989-present. TEES Fellow, for excellence in research 1987-89. Three books and over 300 technical publications.